03 Oct 2018 --- Industry developers are targeting on the go beverage solutions, with items that incorporate between 10 and 20 grams of protein proving especially popular, a poll has identified. Diderik Moerdijk, Marketing Performance Nutrition at FrieslandCampina DMV explores the high protein beverage market segment, tipping clear protein drinks, during a NutritionInsight webinar, entitled Beyond traditional lifestyle nutrition: Moving with the times. According to the webinar poll, almost 60 percent of industry developers are set to launch an on the go product within the next 12 months. Regarding their views on what consumers found the most important thing in selecting an on the go product, nearly 50 percent answered “ease of consumption on the go,” followed by “health and functionality” at 25 percent. High protein levels were also noted as a desirable attribute by the majority of developers, with nearly 40 percent aiming to hit the 10 gram of protein mark in a clear acid protein drink, while about 30 percent would aim for 20 grams. This may indicate a demand for pushing R&D boundaries to incorporate high levels of protein into a clear liquid; however, Moerdijk recommends up to 5 percent protein for a clear protein drink formulation. There is ongoing innovation in beverages, driven by consumers who want more than just hydration from their drinks. Innova Market Insights has reported that flavored or fortified waters are rising as a share of soft drink launches due to their light fresh and healthy image. Beyond fortification, like vitamin waters, the category is expanding to include plant-based waters. Amid this general growth in premium waters, drinks fortified with protein are also experiencing a boost too, fitting in with the trend of waters as a healthy and popular option. Moerdijk highlights market offerings such as flavored and infused waters, those fortified with vitamins and antioxidants, waters that tout hydration and electrolytes and even gut health and biotics. The next category will be protein waters, he states. Similarly, Wiljan Daris, Managing Director at premixes supplier Inscope, tells NutritionInsight that the protein waters category is proliferating. “These protein waters are popular with Millennials, who have a positive attitude towards plant-based products, so we see a huge possibility here,” Daris puts forward. Clear protein drink formulations: What to consider? “The water-like clarity brings the appeal of purity and health to the product. So the packaging is important regarding shape, transparency and underlying convenience,” says Moerdijk. 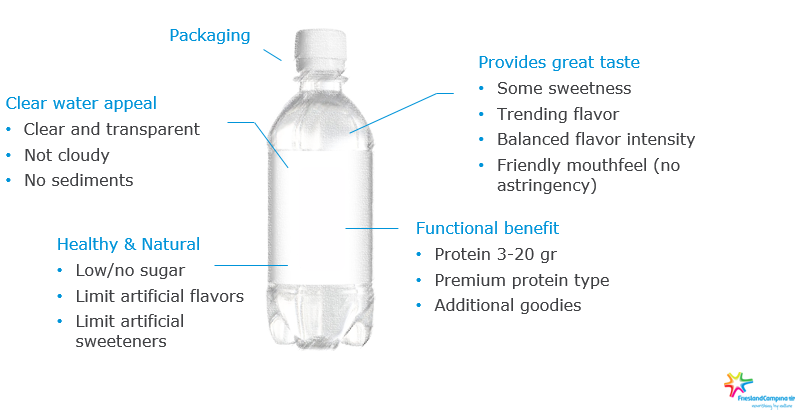 “Avoiding cloudiness and sediments is required if you want to showcase your water-like clarity and avoid being required to ‘hide’ the product behind a shrink wrap packaging label. Limiting sugar or artificial ingredients further enhances the natural concept of your proposition,” he adds. “Transparency of whey protein requires an acid pH; this brings astringency to mouthfeel and an acidic taste, which consumers will not appreciate. Working in less low pH ranges will help this taste. The acidic taste can also be partially offset or masqued by increasing the sweetness, but this could lead to levels of sweetener that exceed a natural or healthy perception,” Moerdijk explains. including its packaging and how to achieve great taste. Clear protein drinks can be fortified with extra ingredients, Moerdijk further shares, such as prebiotics, probiotics or herbs such as ginger and curcumin. To benefit developers looking to enter this market, FrieslandCampina is offering Nutri Whey Isolate Clear. The product is a sweet, cheese whey protein isolate. It is suitable for active lifestyle, senior and nutrition applications and has a pH of up to 3.7. Nutri Whey Isolate will be available from mid-November. Some further companies engaging with this category are Milk Specialties Global who launched the world’s first sparkling protein water – fizzique earlier this year. “Fizzique is an excellent example of where our industry is headed. We’re expecting to see more game-changing products like this in the future,” Milk Specialties Global Vice President of Sales Michael Hiron tells NutritionInsight.